Transferring an installation of Déjà Vu to a new computer is a multi-step process. Below you will find a list of all the steps you must follow to ensure that the transfer of your installation of Déjà Vu from an older computer to the new one will be as smooth as possible. First, you must install Déjà Vu X2 on the new computer. The Installation Guide for Déjà Vu X2 explains how to do this. If you are using a Dongle, you must move the dongle from the old computer to the new one. To do this, simply disconnect the dongle from the old computer and connect it to the new one. Windows will detect the dongle and automatically install the necessary driver for it. You will know this is happening when you see a small green light inside the dongle turning on and off. When this process is complete, the light will be turned on continuously. You can read more about this here. Open Déjà Vu X2 on the old computer where the license is active. Open Déjà Vu X2 on the new computer. Access the menu option Help>Activate, and then enter your activation code in the dialog window that appears. Click OK. Your license will be permanently activated. Once Déjà Vu X2 is activated, you will want to move the files you work with from the old computer to the new one. Déjà Vu X2, unlike other programs, does not have fixed locations for your working files; instead, you decide where you want to store the projects, translation memories, Termbases and documents you work with. Therefore, you must find these files, wherever you stored them, and then transfer them yourself to the new computer where you want to use Déjà Vu X2. Projects: project files have the extension .dvprj, so if you are not sure where your projects are, you can search for files with this extension. Project templates: to find out where Déjà Vu X2 stores its project templates, access the Déjà Vu X2 options dialog, open the General tab, then scroll down to the bottom of the page. There you will see current location of several of Déjà Vu X2's special files and folders, including the Project Templates Folder. DVMDB files are the files that contain all the translations stored in the translation memory; they are the files you cannot do without. The other files, DVMDI and DVMDX, contain the indexes for the main DVMDB file. These files are necessary for Déjà Vu X2 to be able to use the translation memory, but if you don't have them you can repair the main DVMDB file and Déjà Vu X2 will generate new index files from scratch. You will save yourself a lot of time if you transfer the index files along with the main file. Termbases: Termbase files have the extension .dvtdb, so if you are not sure where your Termbases are, you can search for files with this extension. Termbase templates: to find out where Déjà Vu X2 stores its Termbase templates, access the Déjà Vu X2 options, open the General tab, then scroll down to the bottom of the page. There you will see current location of several of Déjà Vu X2's special files and folders, including the Termbase Templates Folder. Custom XML filters: XML filter definition files have the extension .dvflt, so if you are not sure where your filter definition files are, you can look for files with this extension. Alignment projects: alignment projects files have the extension .dvapr, so if you are not sure where your alignment projects are, you can look for files with this extension. The last thing you may want to do is to transfer your Déjà Vu X2 settings to the new computer. This article explains how to do that. 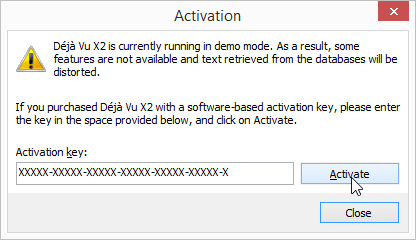 First, you must install Déjà Vu X3 on the new computer. The Installation Guide for Déjà Vu X3 explains how to do this. Open Déjà Vu X3 on the old computer where the license is active. Access the menu option File>Account, then click on Deactivate. Open Déjà Vu X3 on the new computer. 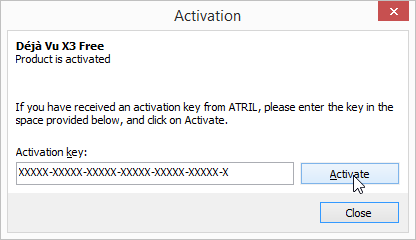 Access the menu option File>Account, click on Activate, and then enter your activation code in the dialog window that appears. Click OK. Your license is permanently activated. Once Déjà Vu X3 is activated, you will want to move the files you work with from the old computer to the new one. Déjà Vu X3, unlike other programs, does not have fixed locations for your working files; instead, you decide where you want to store the project, translation memories, Termbases and documents you work with. Therefore, you must find these files, wherever you stored them, and then transfer them yourself to the new computer where you want to use Déjà Vu X3. Projects: project files have the extension .dvprj, so if you are not sure where your projects are, you can look for files with this extension. Project templates: to find out where Déjà Vu X3 stores its project templates, access the Déjà Vu X3 options, open the General tab, then scroll down to the bottom of the page. There you will see current location of several of Déjà Vu X3's special files and folders, including the Project Templates Folder. DVMDB files are the files that contain all the translations stored in the translation memory; they are the files you cannot do without. The other files, DVMDI and DVMDX, contain the indexes for the main DVMDB file. These files are necessary for Déjà Vu X3 to be able to use the translation memory, but if you don't have them you can repair the main DVMDB file and Déjà Vu X3 will generate new index files from scratch. Termbases: Termbase files have the extension .dvtdb, so if you are not sure where your Termbases are, you can look for files with this extension. Termbase templates: to find out where Déjà Vu X3 stores its Termbase templates, access the Déjà Vu X3 options, open the General tab, then scroll down to the bottom of the page. There you will see current location of several of Déjà Vu X3's special files and folders, including the Termbase Templates Folder. The last thing you may want to do is to transfer your Déjà Vu X3 settings to the new computer. This article explains how to do that.